The machine gun has to be one of the biggest 'game changers' in terms of military weapons in the last 150 years. From the beginnings as a large, crew served, water cooled weapon of the late 19th century, it has evolved into uses its originators could not have conceived, including operations on ships, aircraft, and as light-weight one-person weapons. Throughout all this, it has remained (outside of large explosive devices) the best way to kill a lot of people in a short period of time. When WWII ended, machine guns were divided into light (such as the B.A.R. ), medium (as in the US .30 caliber) and heavy (the .50 caliber fits into this mold). What was really needed was something that would fill all of these requirements into one gun. A general purpose machine gun or GPMG. This was to be a weapon that could use both clips and belts of ammunition. It has to be light enough to be carried by one person or such that it could be mounted on a variety of tripods and crew served. It also had to be reliable and able to operate under a variety of conditions. There were two such weapons developed after WWII. The Soviet PK/PKM series has been built in much greater numbers, but were not the sort of weapons easily available to NATO and other western-aligned nations. For this was the FN MAG. Now both of these guns are not exactly light weight and require a person of some strength and stamina to carry around for a long time, but they are man-portable and effective. 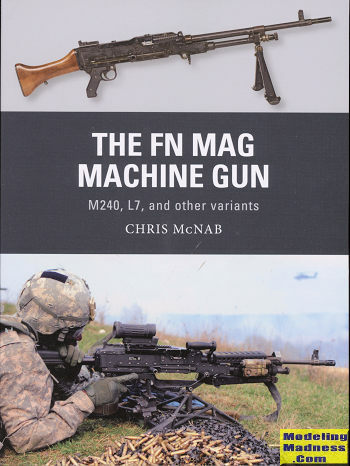 The FN MAG has been developed by several other nations under license to meet their particular needs and is under a constant state of improvement. It has proven itself to be the best of its kind and will undoubtedly continue in this regard for years to come. The book starts off with a background of machine guns and then goes into the need for this specific type. It then covers the development of the type by the original manufacturer. There is also the development of the gun in other nations such as the US and UK that are covered in considerable detail. A goodly portion of the book is devoted to the operation of the weapon as well as the tactics used in different situations. This is all quite interesting reading and adds to the book. As usual in this series, there are well chosen photos as well as some nicely done art work to help illustrate all that is covered. Fans of this series will find they have another winner on their hands.